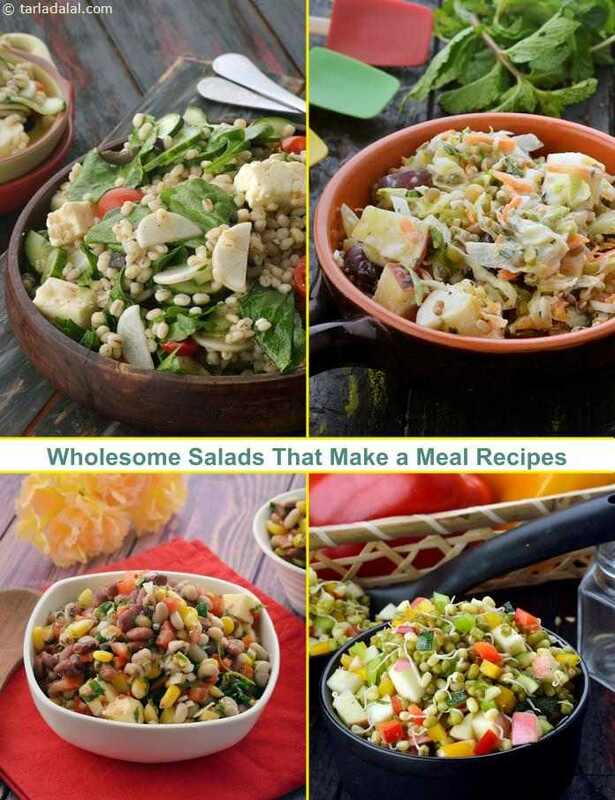 At times when you don’t have time to prepare a full meal, or when you don’t feel hungry enough, but still need to have something healthy and light to double up as a meal, try one of our Wholesome Salads. Options like the Bean Sprouts Salad in a Peanut Chilli Dressing or the Fattoush are as good as a mini meal, and can be handy on a rushed day or when you don’t feel like having a full meal, but we would not advice you to skip proper meals on a regular basis! All things ‘beany’, especially bean sprouts and tofu are very popular in oriental cuisine. Bean Sprouts Salad in a Peanut Chilli Dressing is a tongue-tickling salad of bean sprouts and red capsicum tossed with a tangy and crunchy sauce of garlic, red chillies, soy sauce and peanuts, and garnished with fresh spring onions. Serve the salad as soon as you toss it, to ensure best texture and flavour, and to avoid sogginess.